The opioid epidemic is a national health crisis, and it’s why we all need to know what to do if we witness an overdose. U.S. 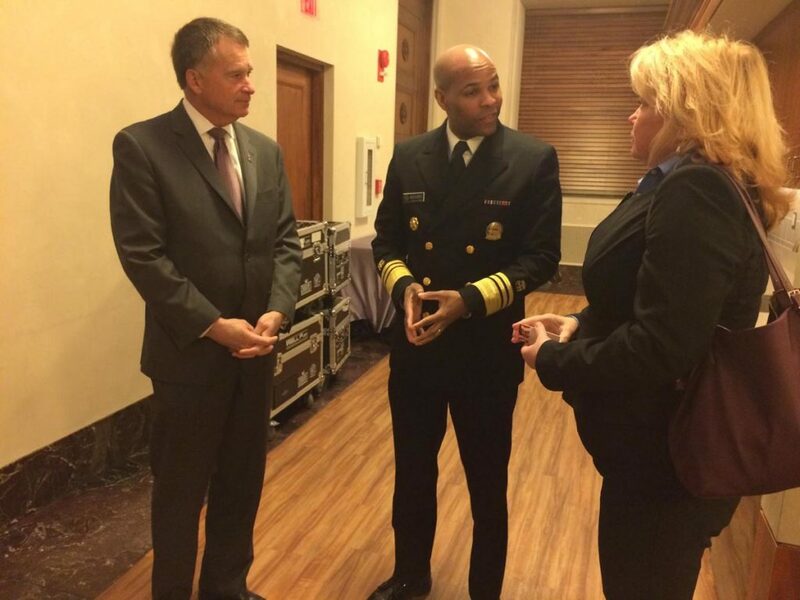 Surgeon General Jerome Adams talks to Mary Winnefeld and Sandy Winnefeld after the US Chamber of Commerce forum on combating the opioid epidemic. As heroin and prescription opioid use increased over the past decade, so did prescription opioid and heroin-related overdose deaths. Among the more than 72,000 drug overdose deaths estimated in 2017, the sharpest increase occurred among deaths related to fentanyl and related synthetic opioids with nearly 30,000 overdose deaths. That’s why U.S. Surgeon General Jerome Adams made a plea in April for more Americans to be prepared to administer naloxone, the opioid antidote, in case someone has an overdose. Note: If you can’t get them to respond, don’t assume they are asleep. Not all overdoses happen quickly and sometimes it can take hours for someone to die. Taking action in those hours means you could save a life. Stay with the person. If you must leave, place the person in a recovery position (place the person on their left side). Look around the victim to see if they are carrying NARCAN (Naloxone), or have it in the vicinity, or if anyone in the area has it . . . and administer it! Don’t put the person in a cold bath. Do no inject them with salt water or stimulant drugs (methamphetamine). Don’t try to have them walk it off or sleep it off.